Chronic obstructive pulmonary disease combines the conditions of chronic bronchitis and emphysema. It may alternatively be defined as an irreverisble condition in which the FEV1/FVC ratio is less than 80%. Almost all cases are related to cigarette smoking. The condition tends to present around late middle age. The male to female ratio mirrors the male to female ratio of cigarette smoking in that age cohort. COPD has previously been known as chronic obstructive airway disease (COAD). A further term, chronic airflow limitation (CAL), never really caught on. Chronic bronchitis is defined as a cough that is productive of sputum for at least three months of the year for at least two consecutive years in the absence of another cause. The affected bronchi demonstrate an increase in the number of mucous glands, at the expense of ciliated columnar cells. Goblet cells also extend into the terminal bronchioles, a location in which they are not normally present. This means that the bronchi more mucus but have a reduced capacity to clear it. Squamous metaplasia can also occur. Emphysema is defined as dilatation of the airways distal to the terminal bronchioles with destruction of the tissue in their walls. Emphysema can be classified into centrilobular, in which the dilatation is centred on the respiratory bronchioles, or panancinar, in which the alveoli as well as the respiratory bronchioles are damaged. This classification may only of real relevance to writers of textbooks and websites. Cigarette smoke acts as an irritant to the airways. As a protective response the bronchial mucosa undergoes hyperplasia of its goblet cells in an attempt to coat itself with more mucus. The squamous metaplasia is also a defence mechanism, albeit one that does at least as much harm as good. The lung normally possesses protease enzymes (including those found in macrophages) and anti-protease enzymes. These two opposing enzyme systems are usually in equal balance. However, cigarette smoke stimulates protease activity while inhibiting the anti-proteases. This shifts the balance in favour of destructive protease activity and this underlies the mechanism by which cigarette smoking causes emphysema. Patients who have COPD are prone to pulmonary infections. The chronic bronchitis element partially occludes the bronchi and hampers clearance of mucus, which creates the stagnant enviroment of which bacteria are so fond. Emphysema also constributes by distorting the anatomy of the distal airways. Various organisms can cause the infection by haemophilus influenzae is particularly adept at exploiting the circumstances. The infection behaves like bronchopneumonia or a more proximally restricted bronchitis but with the added complication of inducing bronchoconstriction. The combination of a loss of functioning lung volume due to bronchopneumonia coupled with bronchoconstriction in lungs that are already damaged can severely impair lung function. 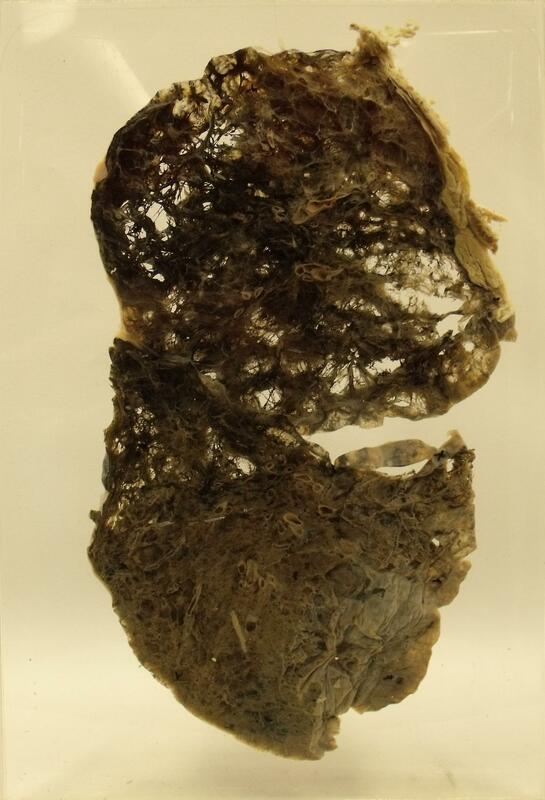 This lung demonstrates marked COPD, particularly the emphysematous component. The upper lobes in particular are threadbare. The hallmark of lung function tests in COPD is a reduction of the FEV1/FVC ratio below 80%. However, many of the individual lung volumes are actually increased because COPD, especially the emphysematous component, destroys lung tissue. Thus there is actually more space in the lungs for air but the tissue that is required to undertake gas transfer with that air is decreased in quantity. The functional consequences of this loss of lung tissue are only appreciated through the more dynamic aspects of lung function tests such as the FEV1/FVC ratio. The elevated production of mucus in chronic bronchitis contributes to the obstruction. The damage to lung tissue produced by emphysema includes a loss of the elastic fibres which help the lungs to constrict during expiration. Loss of this elastic tissue diminishes the strength of the elastic recoil that is a key element of effective expiration. The term 'hypoxic drive' is sometimes encountered in discussions about patients who have COPD. The theory is that some patients who have marked COPD become tolerant of their raised arterial partial pressure of carbon dioxide due to what amounts to resetting of their central chemoreceptors. This means that the only stimulus to adjust respiration is the arterial partial pressure of oxygen and in order to ensure adequate respiration a low level of hypoxia is required. If such a patient is given a high concentration of inspired oxygen during an acute exacerbation of their COPD this oxygen can correct the hypoxia and remove the stimulus to breathe. The patient's respiratory rate and depth therefore drops below a sufficient level and carbon dioxide levels can rise to a dangerous and possibly fatal degree. The chronic airflow and ventilation problems in the lungs can induce pulmonary vasoconstriction (the pulmonary arteries that supply alveoli which have a low concentration of oxygen and high levels of carbon dioxide constrict to divert blood away from these airspaces because they are not advantageous for gas transfer). Persistent vasoconstriction results in pulmonary hypertension which in turn can induce right heart failure. Alpha-1-antitrypsin disease is an inherited enzyme disorder in which there is early onset cirrhosis and panacinar emphysema. Early onset is usually taken to be before the age of 40 years. The condition is effectively autosomal recessive. Alpha-1-antitrypsin is an antiprotease enzyme which is important in both the lung and the liver for protecting against overzealous protease enzymes. Its inhibition can lead to damage to the connective tissue framework of both organs. In the lung this results in emphysema (the inhibition of antiprotease enzymes is also one of the mechanisms by which smoking induces emphysema). The liver suffers cirrhosis. Different mutations can cause alpha-1-antitrypsin disease. The genotype of the normal enzyme is MM. The Z mutation is carried by 1 in 50 European Caucasians. It results in a switch from glutamate to lysine at position 342. As a consequence the enzyme accumulates in the rough endoplasmic reticulum. The S mutation has a carrier rate of 1 in 25 and produces a glutamate to valine switch at position 264. The mutated enzyme is more susceptible to degradation in hepatocytes. By definition, patients who have chronic bronchitis present with a productive cough. Emphysema produces shortness of breath. Given that COPD is a combination of both chronic bronchitis and emphysema, patients tend to complain of a chronic productive cough and shortness of breath. The degree of dyspnoea should be classified. Standard yardsticks are to ask the patient how many flights of stairs they can climb or how far they can walk on the flat. It can also be helpful to inquire to what extent the dyspnoea affects the patient's usual activities and life. Precipitating or exacerbating factors may sometimes be present. Examination of the chest may reveal scattered wheezes, reduced expansion and/or a hyperresonant percussion note. In an infective exacerbation of COPD the sputum will alter from white to purulent yellow or green, possibily with a mild degree of haemoptysis. The dyspnoea will be markedly worse and the patient may complain of wheezing. The findings on examination will be similar to those of an acute exacerbation of asthma. Historically much attention was expended on the concept of pink puffers and blue bloaters. Pink puffers were said to have COPD that was dominated by emphysema. They retained their sensitivity to carbon dioxide and therefore did not manifest a hypoxic drive and were not cyanosed. However, their reduced tolerance of hypoxia resulted in an increased respiratory drive, hence the term puffer due to their elevated respiratory efforts. Blue bloaters corresponded to the patients who exhibited the phenomenon of a hypoxic drive. They were blue due to a degree of cyanosis and bloated because they had developed right heart failure. In real life patients tend not to fall so neatly into either of these two extremes, although the archetypes serve as useful reminders of aspects of the pathophysiology. The investigations are as for asthma. Lung function tests are a key aspect because they determine the FEV1/FVC ratio and whether or not it can be returned to normal with inhaled bronchodilators. Although some degree of improvement is possible with bronchodilators in COPD it is not sufficient to normalise the FEV1/FVC ratio. The most important aspect of treatment is for the patient to stop smoking. Other aspects of the disease are managed in a similar fashion to asthma. Patients tend to have both a bronchodilator and steroid inhaler as a minimum. Infective exacerbations are treated as for an acute exacerbation of asthma but with the addition of intravenous antibiotics. The antibiotics which are chosen are typically from the beta-lactam (penicillins and cephalosporins) and macrolide (erythromycin and friends) classes. Care must be taken with the concentration of oxygen that is given due to the possibility of hypoxic drive. If concerns about the hypoxic drive can be allayed, patients with severe disease may require home oxygen (domicilliary oxygen).